"Who do people say that the Son of Man is?" lots of confusion surrounded this point in the New Testament era. When Jesus asked this, He knew He was the Son of Man, but not most people. Misunderstandings abounded, as to whether it would be Elijah, confusing what the Prophet Malachi had said, or Jeremiah, or another prophet, or even St. John the Baptizer. Even most of the disciples might not have understood what Jesus was getting at here. So He goes on. "Who do you say that I am?" There is the heart of it all. Who do you say Jesus is? Is He a prophet? A kind Man? A good Teacher? The perfect example of love? Yes...He is. But if that is all that He is, then you are still going to hell. If Jesus is just a prophet, you are still stuck in your sin. If Jesus is merely kind or good, He would not be giving you life everlasting. If He is simply an example and teacher of love, you would still be in the devil's loveless clutches. And sure, you say, "Oh! I know better than that! I know Jesus is the Son of God." But do your words and actions follow suit? Or do you speak one thing in church and act another way outside these doors? Yes, when Simon Peter boldly proclaims, "You are the Christ, the Son of the living God!" you are ready to chime right in, "Me too! That's what I say!" but where is your focus? If you keep turning back on yourself, and dwell on how you feel, you are off track. If you spend your time thinking about how you reacted to worship, or how you felt or what you thought during hymns or readings or prayers, Satan has been successful! It is NOT about you. The Lord Jesus is God coming to you. And He does this no matter what you are thinking or saying or feeling about it. Remember, it is not by your reason or strength; He sends His Spirit through His Gifts of Word and Sacraments to forgive you and bring you life. And He does this when and where and in whom He chooses. So would you agree that He is the Christ, just because you thought so, or felt it? Is He the Son of God simply because of your instinct? Absolutely not! The Lord God promises to work through His proclaimed Word, and in His proclamation, He clearly and definitively reveals that Jesus is the Christ, the Son of the living God. That is great news! God Himself has come to bear your sin and be your Savior. He is your Redeemer and Rescuer. And He has given His Spirit to reveal that to you in faith. "No one can say 'Jesus is Lord,' except by the Holy Spirit." And so He has. 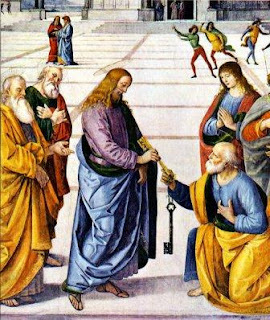 The Holy Spirit was sent by the Father and gifted Simon Peter to confess that Jesus is the Lord, and He gifts you to confess it too! In the 1950's, a show called, "21" was enjoying popularity. Twenty-one was a game show in which contestants answered questions, like "Jeopardy" or "Who Wants to be a Millionaire." But "21" suffered a scandal. They had kept a close watch on ratings, and when they found a contestant that people really liked, they fed him answers so he would keep winning. You have been given the answers, as well. Only with the Lord and in this situation, it is not cheating. He provides the answers for who Jesus is, and gives you faith in Christ! This morning we rejoice as once again the Lord has gathered an amazing faculty and staff here at St. John's. He places them here to support and encourage everyone during their earthly journey, as they receive Jesus' Gifts and are then given to confess that He is indeed "the Christ, the Son of the living God." Our dear Savior has gathered a faculty and staff that is confesses Jesus is "the Christ, the Son of the living God," our only Lord and Savior from sin. He blesses them with faith, and in His love, He uses them to instill this in everyone He gathers here. They believe and confess with you, their fellow baptized faithful, that Jesus is our Risen Lord, who fulfilled that sign of Jonah, of which Jesus spoke soon before this event. Jonah, seemingly dead in the belly of a fish for three days, then given a "life after death." Jesus, truly dead in the belly of the earth for three days when buried, then rises and gives life after death. Dear friends in Christ, because the Father has revealed this to you, too, you believe and confess that Jesus is "the Christ, the Son of the living God." and through that gift of faith, you too receive the fruits of this sign of Jonah -- that is, you too join the Lord Jesus in His marvelous resurrection! Amen.